Best SAT and ACT tutor in the country, Anthony-James Green - The SAT and ACT tutor with the highest average score improvement of any class, tutor, or program in the country. Thanks for Subscribing! You'll be getting your free chapters shortly. 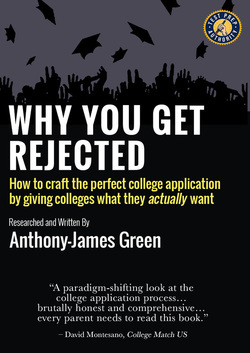 You should get an email any minute now with a link to my new book, Why You Get Rejected. Feel free to share with family, friends, and colleagues, and get in touch if you have any questions or feedback! Please note that my schedule is already extremely tight - if you're looking to work with me, click the "Book Me" tab above to get the ball rolling. I recommend that parents start this process and request a consultation as far as 2 years out from the time they plan to start. If you're looking for a non-SAT/ACT tutor, or for a college advisor, please check my Network Recommendations page for introductions and suggestions. Over the next few weeks, you'll also be receiving a free copy_ of my book Test Prep for Parents, along with additional guides, downloads, recourses, updates, and more. Feel free to respond at any time if you have any questions or need any help!